The MyT10 BlackStorm Folding Ping Pong Table is a fusion of style, quality and attention to detail. This stunningly stylish outdoor tennis table will create opportunities for healthy human interaction outside. 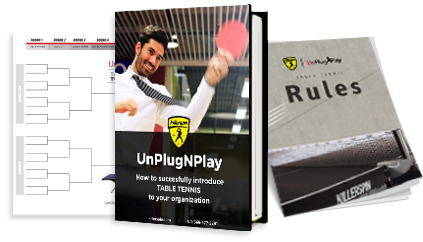 Killerspin proudly exists to connect families, friends, customers and employees through table tennis. MyT10 BlackStorm boasts a quality aluminum-plastic top that is 100% weather resistant. Designed to avoid warping for a consistently smooth playing surface. MyT10 BlackStorm allows you to experience the quality of indoor play, outdoors! Stop chasing balls around the room. Store up to 8 ping pong balls and 1 paddle in each end of the MyT10 BlackStorm ping pong table. These revolutionary Killerspin storage pockets are built right into the table frame. Pockets for ping pong balls and rackets are located in each end of the table to allow easy access to your table tennis equipment. Storage has never been easier. My husband loved his Christmas gift, and the table arrived quickly and in good order. He is enjoying playing on it!